Sky overlays for Photoshop will help to improve your images with creative effects added. 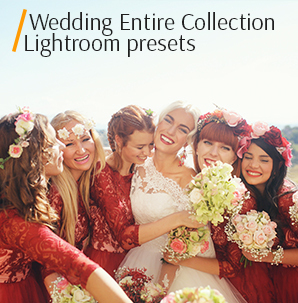 They will complement a photo with bright glare of the sunny sky or fill the atmosphere of the sky before the rain. 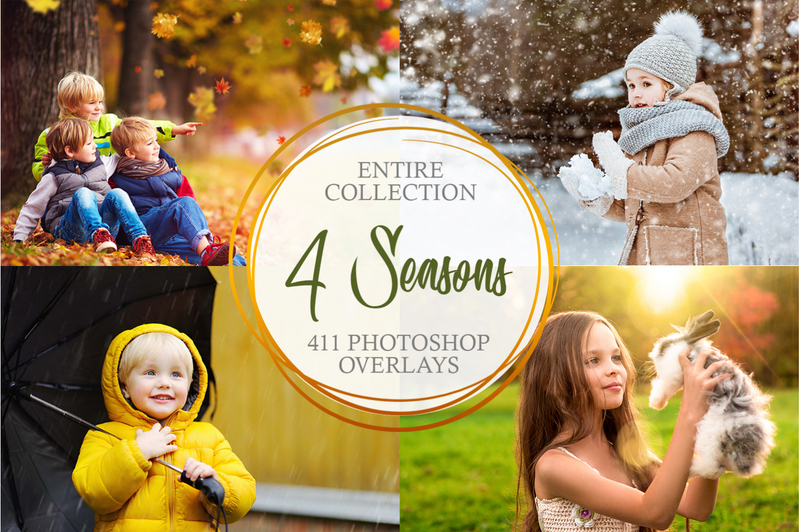 All sky overlays from this collection will be able to bring warmth into your photos, moody thunderstorms or add a stunning effect of the setting sun; the sky will absolutely change its look after using any Photoshop sky overlay free with dramatic effect of the storm and bad weather. Photos are different and with different lighting conditions, so our designers created a unique variety of FREE sky overlays for Photoshop. Using the offered overlays will significantly reduce your time spent on editing photos, and you will not lose the image quality. Using the sky overlays, you will have the opportunity to take a fresh look at your images and bring new creative ideas to life. PS Overlay #3 "Fluffy Clouds"
PS Overlay #4 "Blue Sky"
PS Overlay #6 "Glowing Sun"
PS Overlay #10 "Sunny Day"
You will certainly agree that sometimes the photos look dull and casual if you do not use Photoshop filters and different overlays. If you cannot retake pictures of the sky, and to achieve the desired effect is difficult manually, then it's time to resort to free sky overlays for Photoshop Elements FixThePhoto has made for you. 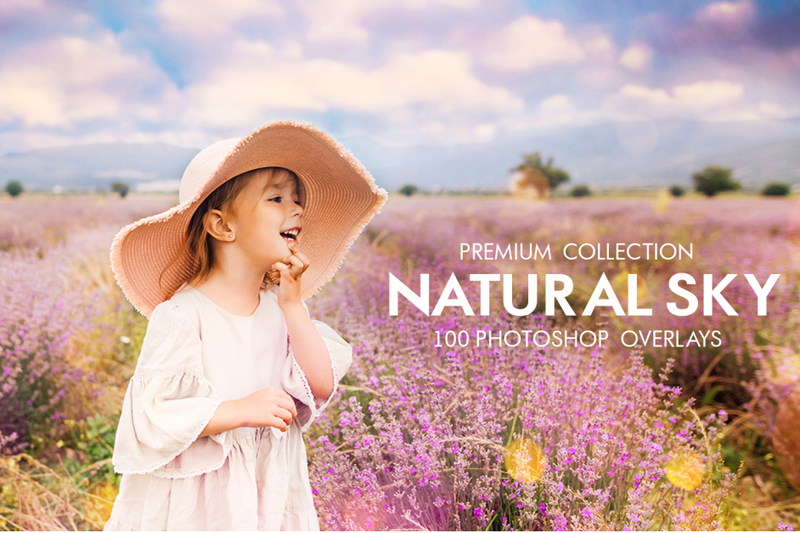 Create a “Wow” effect with new free sky overlays for Photoshop Elements, where the ordinary sky will acquire a new color and turn into a gorgeous one. You can completely replace the sky in your image using any free sky overlay Photoshop or blend effect with the current sky in your image. There is nothing shameful in using free sky overlays for Photoshop elements, as it is not only convenient and easy but also saves a lot of time. You do not need to manually create overlays, search for backgrounds on the Internet or download free Adobe Photoshop sky overlays from questionable sites where advertising and viruses are downloaded to your device. 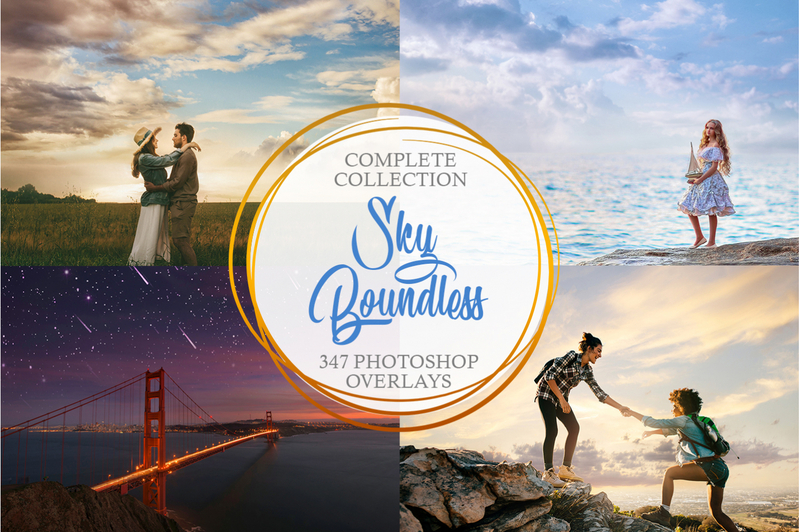 You can download our bundle of free sky overlays Photoshop, and start photo editing right now fast. Download free Adobe Photoshop sky overlays in a convenient JPG format. You can use these overlays for your images, working on a computer, laptop, tablet on all devices that run on MAC or WINDOWS. Apply free Adobe Photoshop sky overlays to any of your images that are saved in Raw and JPG format. Sky Overlay Free Ps #1 "Morning"
Use this free Photoshop elements sky overlay for pictures taken during sunset, if the sky does not look as perfect as you wanted. This overlay #1 was taken from "Dreamy Sky"
Our first classic free sky overlay for Photoshop can be used for any genre of photography. With this overlay, you can add a blue sky, on which three-dimensional white clouds can be seen. Free Sky Overlay Ps #2 "Cinematic"
With this free Photoshop sky overlay you will be able to completely change the photo: the image taken in the daytime will become the one taken at sunset/dawn. This overlay #2 was taken from "Natural Sky"
If you want to add a light gloom and a note of louring sky, then this overlay is just what you need. It will add the gray rain sky, densely clouded. You can transform your shot made with a clear sky and bright sunlight into a very dramatic or even mystical image. Sky Overlay #3 "Fluffy Clouds"
To achieve maximum effect in some pictures, after imposing an overlay, try changing the tone and colors. This overlay #3 was taken from "Dreamy Sky"
To add only a piece of heavy sky and convey the atmosphere of the coming rain, choose this free sky overlay for Photoshop. It depicts the sky before the rain when the horizon is partially covered by gray heavy rain clouds but still there are glimpses of the blue sky. Sky Overlay Photoshop #4 "Blue Sky"
When selecting different free sky overlay Photoshop variants, remember that the sky and the objects depicted in the picture should look harmonious, otherwise it will look unnatural. This overlay #4 was taken from "Natural Sky"
If you want to make your picture more dramatic, then this sky overlay free Photoshop is right for you. You will see a low sky, thick with gray massive and fast floating clouds. Free Sky Overlay #5 "Freedom"
Use free Photoshop sky overlay to enhance the background. It will improve the composition of the frame and make the photo fresher. This overlay #5 was taken from "Dreamy Sky"
Do not be in a hurry to get upset and apply all the filters in a row, if the sky you captured was not as beautiful as you wanted. Try this kind of sky overlay free Photoshop. You will get the sky shrouded in white voluminous clouds. The color of the sky is blue but closer to the horizon it brightens. Photoshop Sky Overlay #6 "Glowing Sun"
If on your photo the sky is reflected in the water, then for the photo to look natural after applying free Photoshop sky overlay, you will need to edit the reflection. This overlay #6 was taken from "Natural Sky"
Pass the atmosphere of the depth, bright and clear sky, as in fairy tales, with the help of this free sky overlay Photoshop. Here is a clear, high, blue summer sky without clouds. 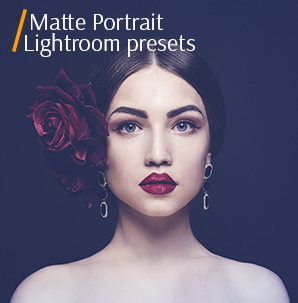 Suitable for any genre of photography, for pictures taken outdoors in spring or summer. Sky Overlay Ps #7 "Vanilla"
Take your beach photos and add them brightness, using this free sky overlay for Photoshop. Perfect for pictures with a clear horizon. This overlay #7 was taken from "Dreamy Sky"
This is one of the few free sky overlays Photoshop that gives the dynamics to your photo. The sky on this overlay is gently blue, the clouds are white and curly, and they swim thick and fast over the horizon. Ps Sky Overlay #8 "Sunrise"
Such variants of sky overlays Photoshop free intensify the emotions on your photos and draw attention to the subjects of photography. This overlay #8 was taken from "Natural Sky"
This sky overlay free Photoshop is very beautiful and unusual. 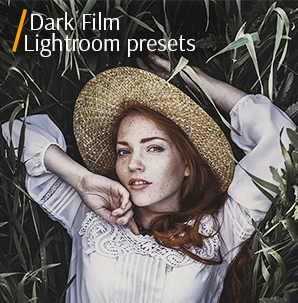 It will help you to add a gray rainy sky to your images. The photo will not become too gloomy and dark because of the massive white clouds and the sun rays. Try applying it to city and street photography. Sky Overlay Free #9 "Cloudy"
If you do not like some elements of the free sky overlays for Photoshop, then you can delete them or fix them using the toolbar. This overlay #9 was taken from "Dreamy Sky"
This overlay will bring lightness and dynamics to your images. You will see a blue high sky, huge white clouds that chaotic swim across the sky. In the foreground the rays of the sun can be seen. Experiment with your photos, where there is a boring sky and apply the proposed overlay. Free Photoshop Overlay #10 "Sunny Day"
Highly recommended to apply on your wedding photos made outdoors. This overlay #10 was taken from "Natural Sky"
The last option from our selection of Free Photoshop Sky Overlays can handle with changing the sky or overlapping the boring sky. Here, the gentle blue sky is almost entirely covered by clouds, only here and there you can see glimpses of the sky. 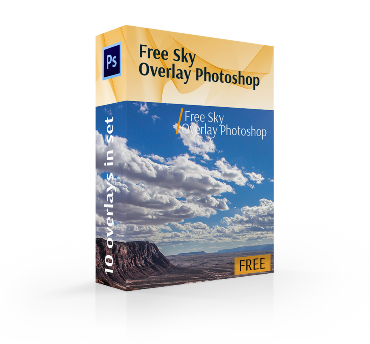 You will enjoy working with all free Adobe Photoshop sky overlays, as they are easy to use and give you unlimited inspiration. All settings are made by professionals who work at FixThePhoto. Do not rush to pay third parties or edit the boring sky in your photos manually; safely download free Adobe Photoshop sky overlays. Leave time for creativity.